Well, the stolen "wishing tree" has been found, and all is well once again in the Galleria Umberto. As noted in another entry, the tradition of the Christmas tree is a relatively recent one in southern Italy, yet it is already an established practice to erect one or two of them in the gallery. 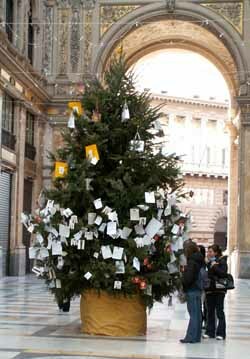 They then become not just Christmas trees, but "wishing trees"—that is, people write wishes on slips of paper and put them in the branches of the tree. This is in keeping with an age-old similar ritual with religious statues and some monuments in the city. When they restored the statue in Piazzetta Nilo some years ago, a number of such scraps of paper were found wedged in the cracks. This year, a local businessman, Antonio Barbaro, donated two 25-foot silver pines to the gallery. The other night, one of them was snatched away at midnight by a band of a dozen kids who hauled it two blocks away into the rough Spanish Quarter of the city. They cops found the tree a few hours later and called Barbaro. He said it had just been a prank by some teenagers who wanted a Christmas tree. "Leave it there," he said. "I grew up in that quarter. They have some wishes of their own to put in the tree." He replaced the tree in the gallery. Yesterday I stood at the tree in the Gallery reading the wishes. Some of the slips of paper are addressed to "Babbo Natale"—Father Christmas. Some are to "Baby Jesus". Almost none of them are for personal gain—no "please give me a motor scooter" sort of thing. Many of the wishes are broadly benevolent—peace in the world, no war, make next year better than this one, etc. Some are simple, personal and heart-rending—"Please make my mother well again." One was delightful: "We're in love and don't need anything else, but thanks anyway!" One was outrageously alien to the spirit of the season: "Please kill Berlusconi [the Prime Minister of Italy] and get Naples back in the 'A League' [the top division in Italian soccer]." After the holidays, the "best" wishes will be printed in book format and sold. This year, the proceeds will go to a fund to combat genetic disease. (Jan 9) Unfortunately the tree is gone again. Last night, the treenappers returned. This time, it was in connection with the wood hunting, gathering & stealing in preparation for the upcoming bonfires on the feast day for St. Anthony. The more wood you can collect, the bigger the bonfire you can build. Anyway, the Christmas season is over and the tree was getting scruffy. It was going to wind up in a fire eventually, so why not mine? 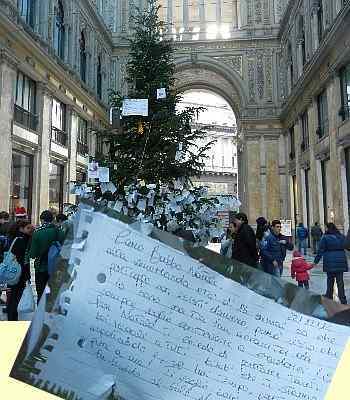 (Dec 1) The "Wishing Tree" for Christmas is already up in the Galleria Umberto and collecting bescribbled scraps of paper in its branches. Keen-eyed readers will have noticed that besides the interesting and syncretistic "new tradition" of ornamenting the northern European Christmas tree with southern Italian votive bits of paper, another tradition has arisen over the last few years (feel free to wipe away a tear or two)—stealing the tree, itself! This year, the city says things will be different. The tree is firmly anchored and will be well-guarded, 24/7. But I still wouldn't bet against the treenappers. At the venerable age if 16, I now know that, unfortunately, you do not really exist, but since I have always been a tenacious fan of yours, I want to keep on believing in you! [Smiley face!]" [Very sharp 16-year-old. Old enough to be a cynic, but wise enough to cover all her bases. Good for her!] So I ask you to bring lots of nice Christmas gifts to all the children who await you, and if you have time, you can drop something off for me, too. I still love you, and dress warm because it's cold at the North Pole. Kisses [heart-smiley]. M.
Update 2013: see this link, both items: Nov. 28 and Dec.19. Also from December 2014, this link & this one. Oh, this from 2017.